Yesterday’s “golf” outing with November Project NYC got my heart rate up to 160 beats per minute, right on the edge (and probably slightly into) anaerobic territory. I’d call that a “hard” workout. While I train following the Maffetone 180 Formula, I’m entering a race season, and need to get in some upper aerobic and anaerobic workouts to increase speed and prepare for racing. It’s all part of training for races. After hard workouts, it’s important to follow up with a day of rest or an easy run. That’s exactly what I did this morning, throwing down a mid-week long-ish run in Central Park. This run felt infinitely better than my weekend long run, likely because I warmed up properly (about 12-13 minutes of walking and jogging before accelerating to my maximum aerobic heart race pace) and really focused on keeping my heart rate under 145 beats per minute. 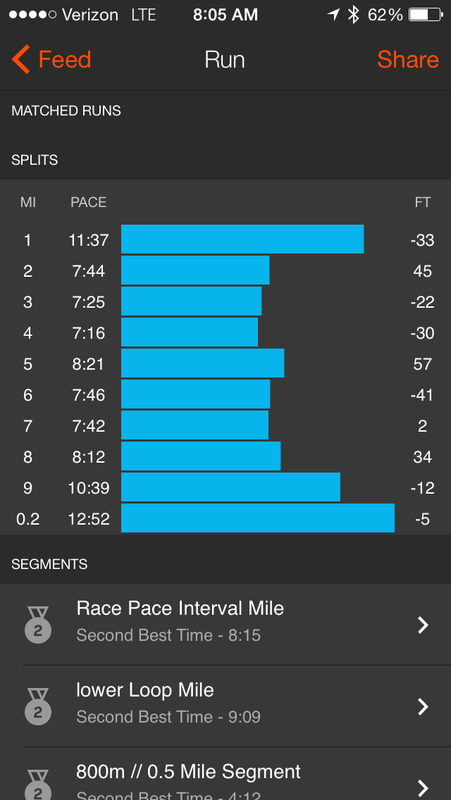 I used Strava to record my mile splits. 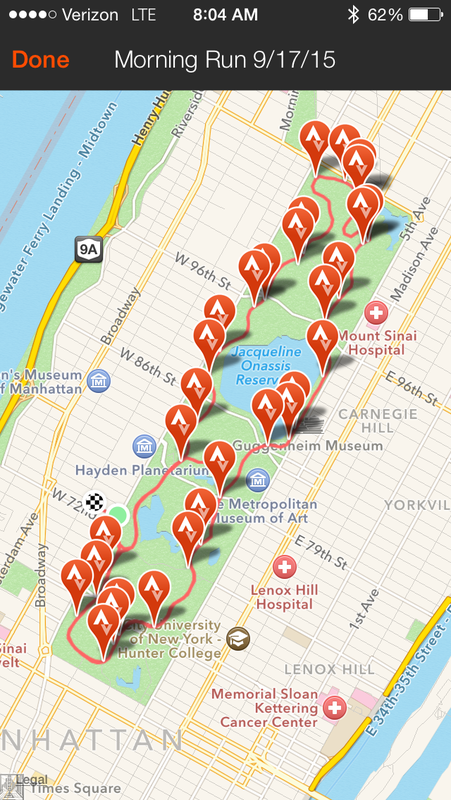 I generally use MapMyRun and, while I like MapMyRun, have heard positive things about Strava. My initial review of the Strava app is this: While I liked how easy it is to use and how it recorded mile splits and average pace, I did not like the lack of instantaneous pace (which MapMyRun provides) and I really don’t like the route map Strava creates (it has lots of flags on it that make it difficult to see the actual route). Maybe these issues are addressed in the premium version. I will explore the online features before making a final judgment. One thing I love about MapMyRun’s website is the “create a route” option, which you can use to determine a run’s length, or plug in a race course to create an elevation profile – very helpful when a race doesn’t publish one. You know you’ve run a solid aerobic run when you finish feeling pleasantly tired, your muscles aren’t sore, and your mind feels sharp. That’s how I’m feeling right now, which is great considering how depleted my mind felt after the NYC Century. ← 9/16/15: Morning Workout: 5:28 a.m., “Golfing” with November Project NYC!